We’d love your help. Let us know what’s wrong with this preview of Letters to an American Lady by C.S. Lewis. On October 26, 1950, C. S. Lewis wrote the first of more than a hundred letters he would send to a woman he had never met, but with whom he was to maintain a correspondence for the rest of his life. Ranging broadly in subject matter, the letters discuss topics as profound as the love of God and as frivolous as preferences in cats. Lewis himself clearly had no idea that thes On October 26, 1950, C. S. Lewis wrote the first of more than a hundred letters he would send to a woman he had never met, but with whom he was to maintain a correspondence for the rest of his life. Ranging broadly in subject matter, the letters discuss topics as profound as the love of God and as frivolous as preferences in cats. Lewis himself clearly had no idea that these letters would ever see publication, but they reveal facets of his character little known even to devoted readers of his fantasy and scholarly writings -- a man patiently offering encouragement and guidance to another Christian through the day-to-day joys and sorrows of ordinary life. To ask other readers questions about Letters to an American Lady, please sign up. Quite good. Read it again in January 2018, and it remains quite good. This summer when Amanda, the boys and I were visiting with her family, Jessica, Amanda's sister-in-law, wanted to take the girls “antiquing.” In fact, this may be one of my wife's least favorite activities. In short, she is not a shopper. Nonetheless, because she is a good sport and because she loves Jessica (who is married to her younger brother, Wade), she obliged. Tonight I finished reading Letters To An American Lady by C.S.Lewis, which I got for free at work a few weeks ago. I have never actually read this one by Lewis before. It was a moving correspondence between Lewis and this American lady about anything from cats, food, pain, death, health, prayer, finances, the weather, faith, books, theology, daily experience, the resurrection of the body, loss, and love. The few letters in this volume written by Warnie Lewis, Joy Davidman, and Walter Hooper, wer Tonight I finished reading Letters To An American Lady by C.S.Lewis, which I got for free at work a few weeks ago. I have never actually read this one by Lewis before. It was a moving correspondence between Lewis and this American lady about anything from cats, food, pain, death, health, prayer, finances, the weather, faith, books, theology, daily experience, the resurrection of the body, loss, and love. The few letters in this volume written by Warnie Lewis, Joy Davidman, and Walter Hooper, were very quite good too. I haven't read as much C.S. Lewis as I would like (I've read neither all of Mere Christianity or The Screwtape Letters, horror of all horrors), but I've very much liked his more autobiographical works - Surprised by Joy and A Grief Observed particularly. I first read some of Lewis' letters in A Severe Mercy where Sheldon Vanauken begins a correspondence and friendship with him - an influential one, to say the least. These letters, however, are a another kettle of fish altogether. They are one si I haven't read as much C.S. Lewis as I would like (I've read neither all of Mere Christianity or The Screwtape Letters, horror of all horrors), but I've very much liked his more autobiographical works - Surprised by Joy and A Grief Observed particularly. I first read some of Lewis' letters in A Severe Mercy where Sheldon Vanauken begins a correspondence and friendship with him - an influential one, to say the least. These letters, however, are a another kettle of fish altogether. They are one side of clearly a voluminous correspondence of thirteen years, and nothing is seen of what was written to him. But, somethings do come out, looking at his responses. In truth, I would certainly think that they started as fan mail - and of a strange sort. Come, do tell me if you were writing to your favorite author would you mention that your back hurts, your friends are mean, your dog is sick, and you can't find a job? Or, persist in writing him long letters to which he can't help but respond in short and say, 'I really do hate writing?' And, have him say almost plaintively for three years in a row, please do not write (or expect an answer!) during Christmastide! And yet, there is something very comforting in Lewis' continued kindness, seen from his reactions to her letters to him. He assures her of his continued prayers, doles advice, and even supports her via a stipend from his American publisher. There is the hint of the scholarly professor who got up early, wrote his books on the side, can laugh at a joke, and misses his long walks but wouldn't trade his health for that of his dying wife's. Indeed, one of my favorite parts of the book, however, was a letter written by Joy Davidson Lewis (writing in his place, when he was conducting exams at Cambridge) - there you can see some of the spark that hides behind the bare 'H' in A Grief Observed. And that strikes me as one of the more telling parts of this correspondence - yes, this may have been a marvelously one sided conversation at times, but whether it be simple responsibility, kindness, or Christian charity, it continued for thirteen years, even when he himself was facing a great deal of pain and personal grief. One of the questions that came to me while reading this book was why were these letter published as a collection? Indeed, their very ordinariness was appealing, I suspect, but really, how did they reflect said "American Lady"? And what becomes obvious is this: these were some of the first letters given to the Marion Wade Center at Wheaton College right when they were beginning to collect writings by Lewis and others of his circle. Their publication - and the collection's curator who as the book's editor has an obvious admiration for Lewis - did much to recommend the rather new center and its collections, I would think. And who can begrudge them that? Oh, where to start? This book is so appealing on multiple levels--first, it appeals to the nosy snoop in me, which SO enjoys reading other people's mail, especially people in whom I have such an interest. Thankfully, this book allowed me to do that without breaking any federal laws--here or abroad. Secondly, it made 'Jack' Lewis even easier for me to love than he had been before. The situation was this: Lewis, already known worldwide and well respected literarily and academically, received all k Oh, where to start? This book is so appealing on multiple levels--first, it appeals to the nosy snoop in me, which SO enjoys reading other people's mail, especially people in whom I have such an interest. Thankfully, this book allowed me to do that without breaking any federal laws--here or abroad. Secondly, it made 'Jack' Lewis even easier for me to love than he had been before. The situation was this: Lewis, already known worldwide and well respected literarily and academically, received all kinds of letters from all kinds of people. Returning them (all of them) was an exercise in self-discipline and subjection of his talents, in spite of a rheumatic wrist and a supreme distaste for letter-writing. When he returned Mary's first letter, he was kind and brief, and invited no reply...but he got one anyway, and HER letter did beg a response (we don't see her letters, but by his responses we can tell that she expected one). But what I loved most in this brief collection (which became, for me, a real page-turner) was seeing Lewis as 'the man at home,' who got sick, experienced grief, and still made time for pen pals everywhere, personality notwithstanding, and prayed for them daily. I do believe that I detected the inklings of a genuine enjoyment of his correspondence with Mary toward the end, and it is neat to think that they have met at last in Heaven. As for me, I am excited to read more of his works while I can, and meet Lewis when I can't read anymore. Becoming more intimately acquainted with the trials of old age and ill health since my previous reading (by becoming a caregiver for my grandmother) made C.S. Lewis's many physical hardships truly stand out to me. And even though I am still young, I thought of the things that slow me down or stop me in my tracks even now--most particularly, the sinus headaches that won't go away (from which, oddly, both Jack and Mary, his American correspondent, suffered). Add to that rheumatism, a weak heart, trouble sleeping at night, trouble staying awake during the day, a wife with cancer, a wife who died of cancer, two stepsons whose mother died of cancer, and also his regular work as professor, lecturer, and author, it is a wonder to me that he responded so faithfully to the inevitable onslaught of the post. I was genuinely inspired by his example of putting others first. Although I can't stop my body from acting up sometimes (and I'm sure much more as I age), by the grace of God I can stay humbly dependent on Him and serve Him with as much energy as He's granted for that moment. Lord, may this be my pursuit. This little book shows a different side of C.S. Lewis – not the great apologist, but the simple everyday piety of a godly man praying for someone he has never. Lewis developed a friendship with this woman over the course of several years. These letters cover every imaginable topic, from pets and weather to the forgiveness of sins; many are simply an attempt to encourage each other as their bodies decay from old age. Very encouraging, very convicting. "We were talking about cats and dogs the other day and decided that both have consciences but the dog, being an honest, humble person always has a bad one, but the cat is a Pharisee and always has a good one." I very much enjoyed seeing Lewis, my hero, kind of behind the scenes like this-- there's always another facet of him to know. This collection of letters is at times touching, at times encouraging, and at all times fascinating for the Jack-junkie. Lovely insights into the power of a simple friendship. Nice to get a glimpse of the very ordinary aspects of Lewis. This record of correspondence between Jack and Mary showed Lewis' casual wisdom and wit. Even in the everyday letter writing of good ole Clive, his writing convicts, teaches, and challenges. I loved so much of this book. This book deals with challenges like death, illness, family drama, politics, and faith in Jesus. It's really fun to read one side of the letters and try to figure out what Mary wrote to lead to Jack's response. "The change from, say, thirty This record of correspondence between Jack and Mary showed Lewis' casual wisdom and wit. Even in the everyday letter writing of good ole Clive, his writing convicts, teaches, and challenges. I loved so much of this book. This book deals with challenges like death, illness, family drama, politics, and faith in Jesus. It's really fun to read one side of the letters and try to figure out what Mary wrote to lead to Jack's response. I was surprised by how fast I whipped through this book. My second time reading it, but it's been a long time since the first read and I couldn't remember much. While some of the material becomes repetitive (his sympathizing with her health troubles and his reminding her that writing is the bane of his existence!) I still found so much of value in this collection. C.S. Lewis was so encouraging to Mary (the American Lady) and good at reminding her of truths that they both believe while avoiding be I was surprised by how fast I whipped through this book. My second time reading it, but it's been a long time since the first read and I couldn't remember much. While some of the material becomes repetitive (his sympathizing with her health troubles and his reminding her that writing is the bane of his existence!) I still found so much of value in this collection. C.S. Lewis was so encouraging to Mary (the American Lady) and good at reminding her of truths that they both believe while avoiding being preachy. He also showed his real personality. These are not mere polite letters. They are at times curmudgeonly or almost annoyed (like when he says he is sure he has written to her since her last letter), but often deeply sympathetic. (How did he manage to remain so sympathetic over all her troubles?) He felt free to disagree with her or defend his opinions. And despite the fact that the correspondence sometimes comes across as a burden to him, he clearly also cared for this American lady. He prayed for her consistently and took the time to ask his wife, brother, or secretary to write when he was too ill to do so. So mundane they’re fascinating. Felt a twinge of grief when the letters abruptly ended. Lewis’ Siamese cat liked it when he picked it up by its tail. My first non-fiction by Lewis. An interesting read. Only getting half of the conversation makes for a unique reading experience. A very interesting smattering of religious thought and ideas throughout Lewis' letters. I look forward to reading more of Lewis' nonfiction. Much that's great, but boy, if that isn't one of the saddest endings I've ever read. The abruptness of the final letter makes it so much worse. This book is a collection of letters written by C. S. Lewis to an American woman during the last 13 years of his life. I found it pretty dull reading at first. The book only contains Lewis' half of the conversation and most of the letters are pretty short or deal with trivial matters. 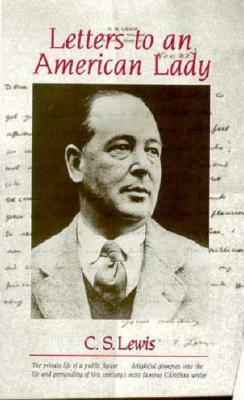 But, for those who are interested in a more of a personal glimpse of Lewis there are some interesting insights offered: Like what he thought about what journalists have written about him in papers and magazines, hi This book is a collection of letters written by C. S. Lewis to an American woman during the last 13 years of his life. I found it pretty dull reading at first. The book only contains Lewis' half of the conversation and most of the letters are pretty short or deal with trivial matters. But, for those who are interested in a more of a personal glimpse of Lewis there are some interesting insights offered: Like what he thought about what journalists have written about him in papers and magazines, his correspondence during the years of his marriage to Joy Davidman (and after her death), the heaviness of the load of correspondence he carried on with many people. Lewis appears to have seen letter writing as more of a duty than a pleasure. He often complained that the load of personal mail made his life miserable, especially at Christmastime. Yet he seems to have faithfully read and answered all those letters. Great read if you want to get to know the man behind the Chronicles of Narnia and his other works. You learn things like his opinion on cats vs dogs. Brilliant nuggets and wisdom here. Beautifully written in true Lewis form. It was nice to hear his voice again. Miracles do exist. I would like to hear his lecture on Hume. Prayer always. Blessings always. I struggled with this book at first, since it only gave me one side of the conversation. But then I realized it was more about C.S. Lewis' private thoughts and how we can learn so much from them. It also revealed much about his private life. C.S. Lewis was a very great man, thinker and theologian! Good sense, good humor, good advice. Loved this! Definitely recommended for C.S. Lewis fans, along with Surprised by Joy and A Grief Observed. While SbJ is a well-thought-out autobiography and AGO is a beautiful expression of sorrow, Letters to an American Lady is simply Lewis as a normal person, capable of everyday pleasures and fears. Lewis liked cats, he liked pleasant weather, he disliked the commercialism of Xmas v. real, peaceful Christmas, he rather disliked having to respond to letters, since it took so much work...His handwriting was a bit illegible. Little things that just made a completely human connection. LtaAL really displays exactly who Lewis was, even more than his autobiography does, because it is simple, unedited prose, written straight from the heart. And so, Lewis' humor, his compassion, his warmth, and a hundred other endearing qualities are brought to life through a quick, easy read. And of course, throughout the book, Lewis makes observations on life that are just so wonderfully casual that you can't help taking them to heart. He says continually that people try to maintain a sense of "total independence", when such a state is actually unreachable. One of the scariest and seemingly most impossible challenges, according to Lewis, is to truly depend on God, and not on personal triumphs or successes...Very inspiring. Wow, what a nice little surprise. I found this at a book sale and I had heard of it before, but of course, name recognition prompted me to pick it up. It's very sweet, letters only from the Lewis side to an anonymous American lady. There are a lot of letters about work and their respective illnesses, and also a lovely interlude when he married his wife Joy and was worried about her health and enjoying her company before she died. I didn't realize that he didn't marry her until he already knew she Wow, what a nice little surprise. I found this at a book sale and I had heard of it before, but of course, name recognition prompted me to pick it up. I didn't realize that he didn't marry her until he already knew she had cancer. The letters continue nearly until his death, and then, as death will tend to do to a correspondence, they abruptly end. It was all just very natural and nice, a window into a thinking, practical person's life, the minutiae and the little big ideas.